There is a plethora of songs and poems written about the pains and struggles of loneliness. Just the mere abundance of this is evidence of the human resistance and opposition to being alone. It seems to weigh down the heart, cut one off from community and society, revealing that deep inside each one of us lies a longing and a yearning for communion at some level. How we react to this and cope with this in our lives may reveal quite a few things about us. The easy way out of this is to go ‘hunting’ for company, and the prevalence of singles’ bars in cities all over the world are a testimony that this seems to be a go-to place to address this need. The ‘one-night-stand’ culture that is quite often the result of these casual encounters purport to satisfy this insatiable need for deep and meaningful company and companionship, but as many, if not most will tell you, they leave one feeling more empty, more void of depth and more lonely than the night before. Rather than feeling more energized, as meaningful relationship should, these often leave the individual simply enervated and dissipated. But the fact that these people return over and over again to this defeating spiral shows that there is something terribly addictive in addressing loneliness in an easy way, when there is little or no responsibility involved, and more importantly, when the default choice seems to have no true personal investment of the self. On the contrary, what lasts, what has depth and what leads to true growth and maturity is far more difficult and requires a deeper investment of the self. If loneliness is an emotion that we share in our broken humanity, what is the best response to it that we can have? Knowing that so much problems and heartaches result from turning to using people or substances to stave off this fear of having to face being alone, where then can we find a true way of coping that is sustainable and still gives us room for growth and maturity? For many, marriage is one way to do this, but when one enters into marriage largely for the purpose of staving off loneliness, the partners in the marriage will very easily find themselves either using each other or abusing each other. The sad truth is that there are many marriages in which there still exists very much loneliness. What had not been addressed before marriage as far as loneliness and filling that void in the heart meaningfully was concerned, is often then simply imported into the married state, leaving one to make it possible to live a ‘married single’ life. Rolheiser remarked that it was a very bad reason to become a priest. I probably would have expressed it in a less charitable way. 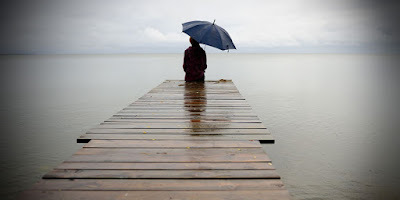 When one has not dealt with the mystery of loneliness and the innate longing for healthy and meaningful bonds of human connection, even a celibate life can be one in which others can be used and abused. I suppose this can help to explain why there are many priests who experience vocational crises in their priesthood, or who may even be parish terrors. There is a deep difference between loneliness and solitude. Solitude is nurtured when there is a healthy understanding of waiting which develops the virtue of patience. This is experienced when one is not constantly craning one’s neck to look out for the next distraction in life, when one is appreciating the things and the people in one’s life at any one moment in time, and when one is not harbouring the hope of being somewhere else other than where one is in at the present moment, or to be with someone else. When this happens, one is training oneself to wait in a healthy stance. This is undoubtedly more difficult and requires more self discipline than turning to any act of immediate gratification which at best may keep at bay the inner hungers for a short span of time, but at worst will leave us feeling drier and hungrier than before. Perhaps it is for this reason that all religious and priests need to take seriously that daily one hour of silent prayer before the Blessed Sacrament for the rest of their lives. Among other things, it serves to shape the loneliness that the celibate life necessarily imposes to become the solitude that brings holiness to one’s life, and more importantly, to allow this holiness to steep into the relationships and ministry work that the priest or religious is involved in. My personal experience has been that this does help me very much in being as present as I can to the person who is standing right in front of me. I am also convinced that it is only when a celibate is integrated with his or her aloneness with God, that one can be truly joyful in service. Otherwise, celibates can easily end up being as cheerful as consecrated refrigerators. thanks Fr Luke for the great write up or rather a great testimony. I would say that level of loneliness differ from one person to another. To some.. a few hours away from friends or work is loneliness while others coming home with no one to talk except maybe TV is also loneliness. on solitude.. spending time in prayer or with the Lord or meditating is never a waste. In fact it's a much needed grace. furthermore it calms down our anxiety and fears.. a much needed form of therapy beside grace..
God Bless all!.. Btw.. Fr Luke i pray for you to remain in good health always.. Thanks Fr Luke. This article provides food for thought. A great takeaway for me - now I understand better, the distinct difference between loneliness and solitude better. God bless. Thanks frLuke. Not only religious and priests, but all who seek the joy of silence, the one hour with Jesus is a must! i started with 10 mins and over a decade at least, i am now enjoying the Hour and it frees my other remaining hours from having to seek less meaningful companionship. The joy in the Hour of solitude pervades the remaining. “There is a deep difference between loneliness and solitude.” And I do agree with you on that, especially with the emphasis on the word ‘deep’. At mass, the homilist in mild reproach, spoke about our current tendency to cling to the ‘things of the world that cannot last’ whereas we should heed what Our Lord was saying - “Heaven and earth will pass away, but my words will never pass away.” Reflecting on this, I felt that our loneliness and feeling of emptiness is possibly because we do not seek for what is permanent and so there is a sense of a disconnect. Perhaps if we had invested more time in solitude , we would be able to walk inside our selves and discover an inner depth, a richness to be mined – for creativity and thinking besides sustaining and restoring our body and mind. May the Lord continue to give you strength and faith to face each trial. This is what we are called for a True Christian.